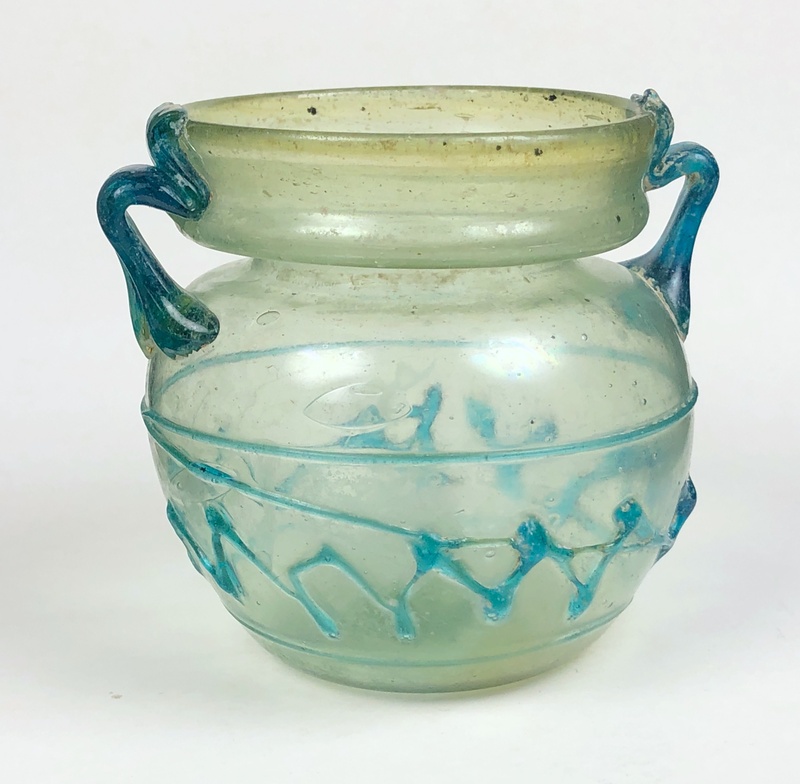 Remarks:The short-neck jar is a type of Roman glass which first appeared in the Third Century AD and became a common shape during the 4th and 5th Centuries. Its characteristic globular body was often decorated with pinched ribs, indentations or trailed-on threads. The example here is one of the most classic designs of the type. This jar is made of pale yellow-green glass, having turquoise handles and light turquoise zig-zag trailing. It has a pontil mark and is intact. 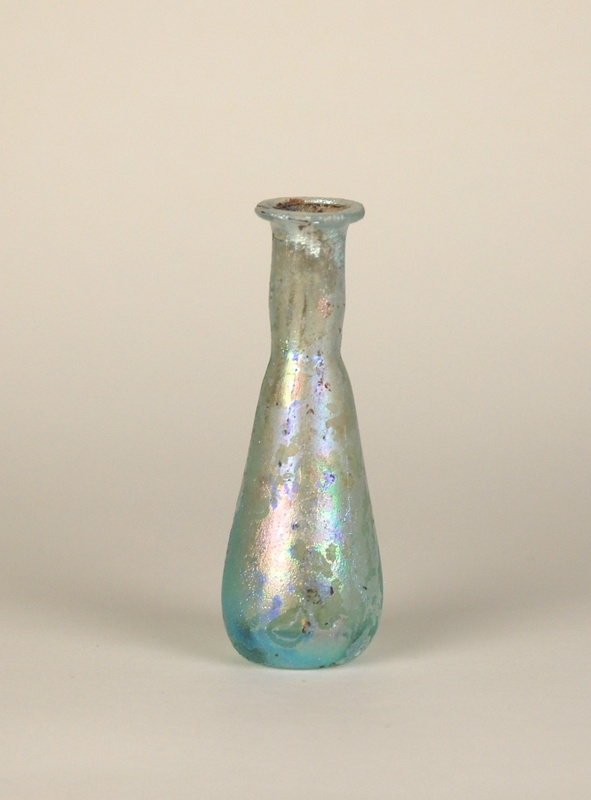 Remarks: During the First Century, glass artists were using colored glass to a great extent. The most popular colors used were blue, auberegene and amber. 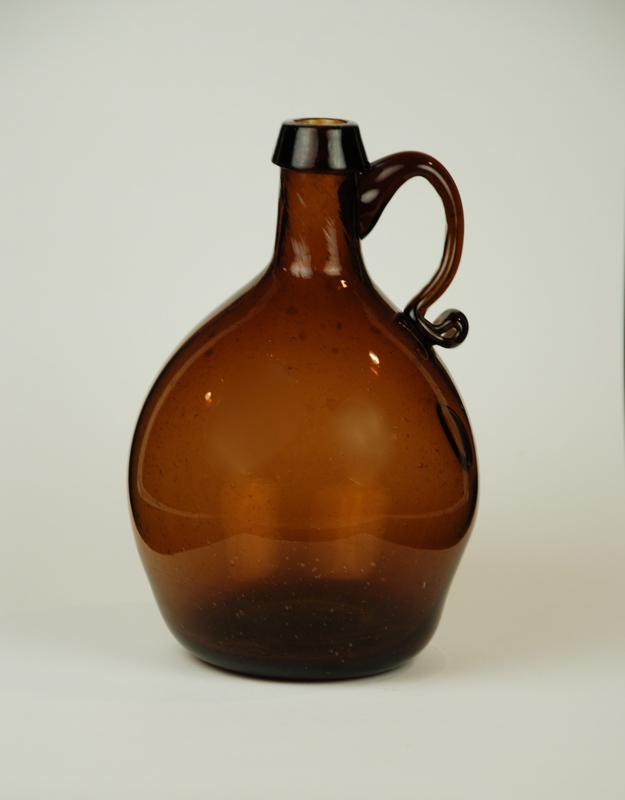 This bottle is a simple globular shape decorated with a thin white trail spiraling around the body and bottom of the base. Its 150th Anniversary of the Tabasco Sauce band. The company Mc Ilhenny Co. is celebrating (https://www.nytimes.com/2018/04/23/dining/tabasco-mcilhenny-diamond-reserve.html) with a Special Tabasco in a new bottle. Located at banks of the old Meuse river and at the harbor area of the historical intercity of Dordrecht you will find the Dorts Patrician House active link, a beautiful monumental house which gives you a great impression of life at the end of the 18th century. Have a look at the fine details, paintings and drawings in this authentic 18th century house. The new show ‘GLASS THROUGH THE AGES“, will run from April 12, 2018 through October 7, 2018. Now, as a visitor to the Patrician House, you can see this beautiful exhibition. The glassware that is shown comes from the collections of Hans van Rossum, Nico Bijnsdorp, Aad v.d. Born, Joop van der Groen, Martin, Annelies and Elisabeth & Theo Zandbergen starts with very early examples from the 6th century BC. These are followed by over 120 Roman glass objects, dated 1st – 5th century AD. Also on display are silver coins showing the Roman emperors being paired with glass objects in use at their respective reigns. A nice example is the coin depicting emperor Otto, who was bald as a coot, wearing a wig. A unique display.In another display cabinet drinking glasses are shown from the 1st century AD.to the year 1923, including a Merovingian cup. For additional information about the collections of these five contributors to the show click on their names and you will be taken to their page on this site. For visitors there will be a very special offer to buy the book: Roman Glass borrowed from Private Collections with many high-class illustrations and the complete story of the production and used techniques by the Roman glass-workers. Visitors of the museum don’t pay € 19,95 but only € 7,50. Remarks: This is handled whiskey bottle with a seal from the Ambrosial BM & Co. 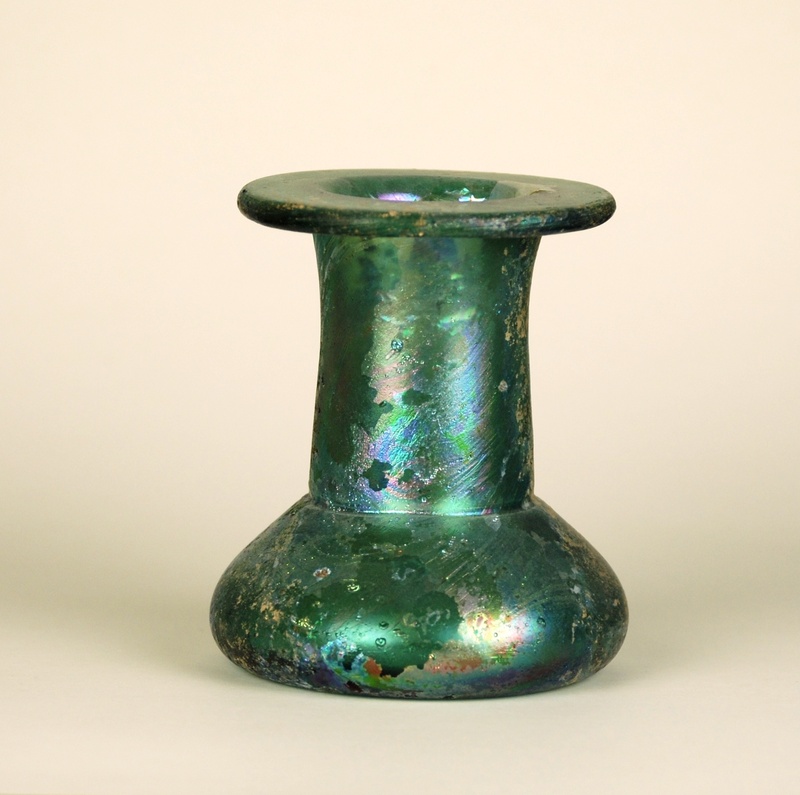 Remark: This perfume holder characterizes a common type of glass made in Egypt during the Second and Third centuries A.D. The dark green color, wide neck, thick walls and base occur on all of the pieces from this group. These sturdy containers were probably used for shipping perfume. It is intact with brilliant iridescence. Remarks:A typical late First Century shape appears in this slender, small and very common unguentarium also called a tear bottle. The blue green color and silvery iridescence greatly compliments this simple shape making it an interesting piece. 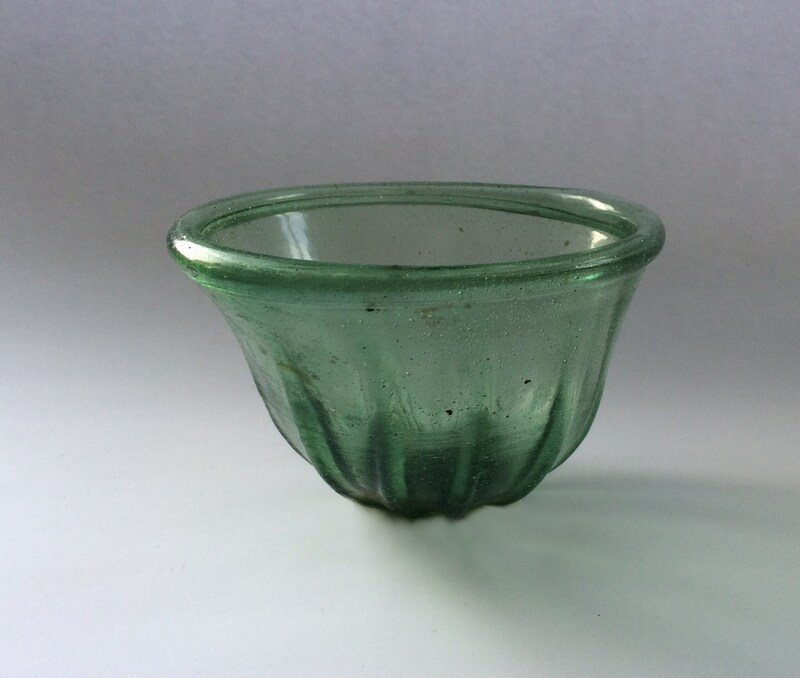 Description: Mold blown cup of transparent, green thick-walled glass with air bubbles and some particles. The shape of the tumbler cup is basically round. The walls run from the base with a slight curve upwards, at the lip turn slightly outward. From the bottom 13 more or less pronounced vertical ribs rise up, at irregular distances from each other and also differ in thickness. With a single exception, they do not go all the way to the reinforced edge. In the Merovingian period, rural residents in Northern Gaul had access to a rich and varied material culture that partly came from distant regions. The enormous amounts of archaeological objects show that there was obviously a great demand among the rural population (outside the control of the elite). Aspects of this include life cycle rituals such as those around the burial of a dead person. The Merovingians used much more glass than other Germanic peoples, probably because they had been living in a Romanized environment for a lifetime. 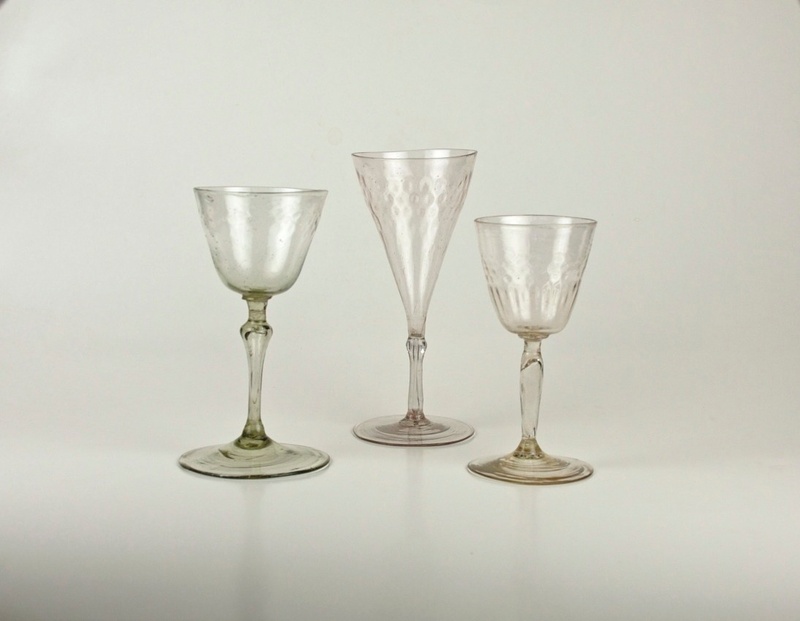 At that time, almost all drinking cups were made of glass. 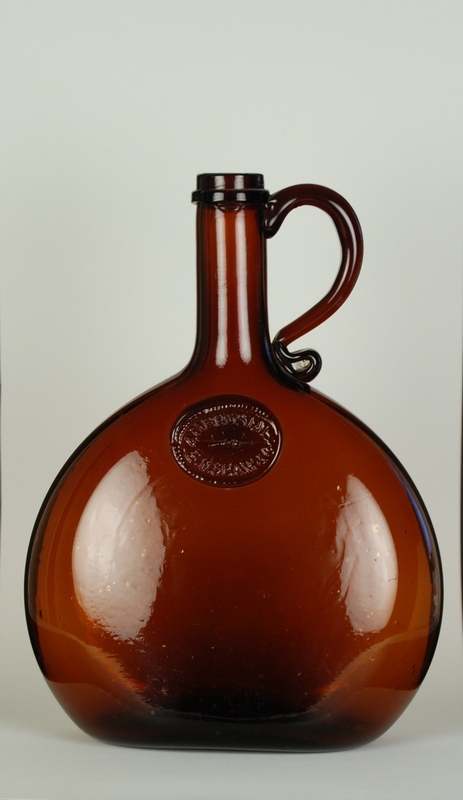 There are about 30 glass shapes: 16 drinking glasses, 3 jugs or bottles (probably intended for use at the table), 3 open dishes (serving food), 5 storage bottles and 3 different forms of which the use is unknown. (Stern 2001) In the transition from late Roman to the Merovingian or Frankish period, some Roman type glass vessels were initially produced from late 5th to end of the 6th century. 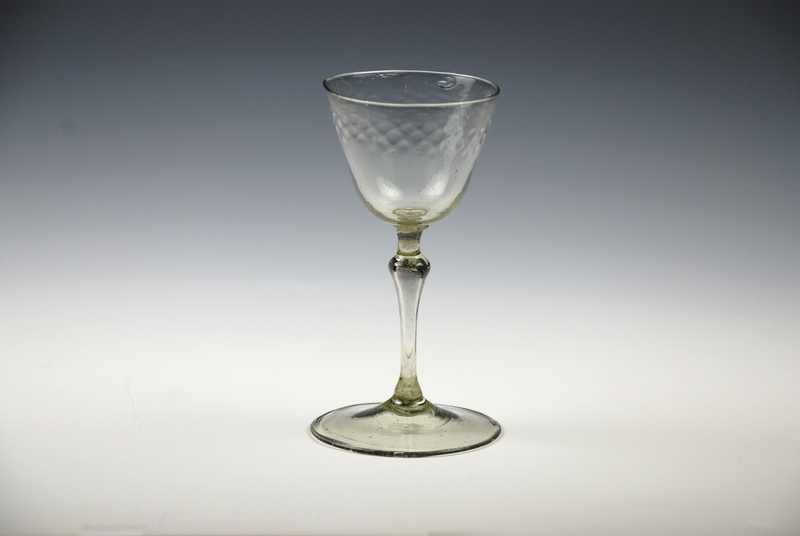 These types were drinking vessels such as goblets, bowls, and dishes sometimes with simple decoration. An expansion of the assortment takes place with variants such as pouring or beaker cups, pouch and trunk cups, tankard, bell and cone beakers and also glass drinking horns. 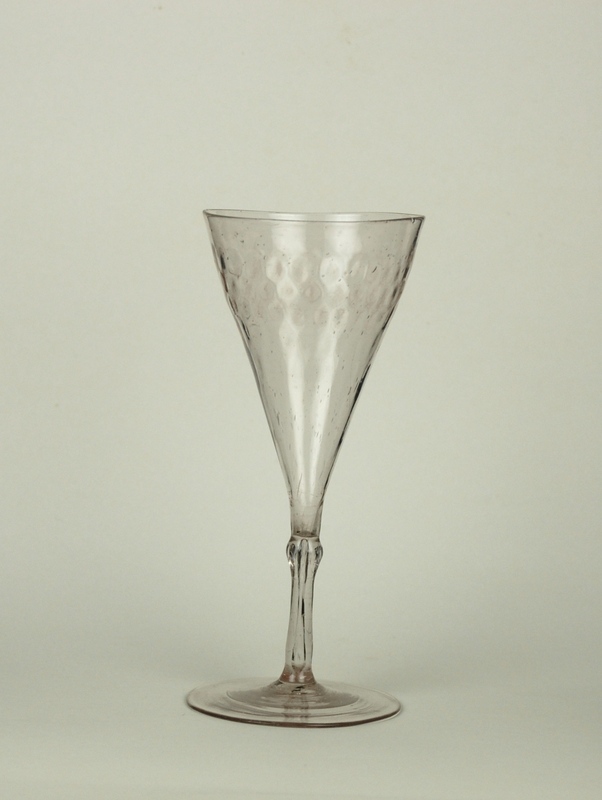 Sometimes these vessels were decorated with ridges or twists and glass threads, the convex bottom ends or not with an extra point, so that the glass cannot stand alone. Because there is no known evidence, it is generally assumed that they were placed in sand, straw or upside down, before or after use. Other types include round caps and small shallow tumbler cups (with round bottom, sometimes a kind of cross). The tumbler cup that is shown was probably made in a single mold, made of wood, earth or stone. Research (J-Y.Feyeux 1990) has shown that multiple molds were not used in the Merovingian era. 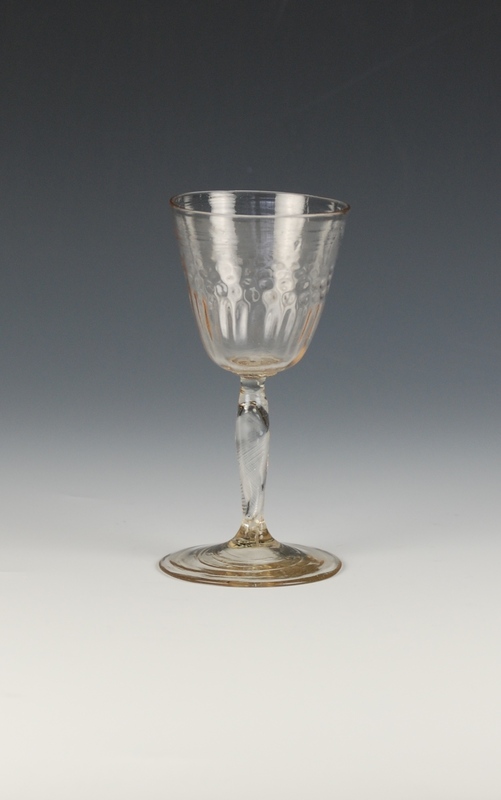 To demonstrate how tumblers were produced in that era, a number of experiments were carried out in France. For economic reasons, a method with a kind of box of wood (with a removable bottom) and molten sand was chosen at the time. Partly due to the fine composition of the granules and the compactness, this gives excellent prints. However, molten sand has the disadvantage that it cannot withstand high temperatures and the mold can only be used for 4 to 5 copies. After placing a real ribbed cup in the sand, a flat piece of wood was put on it and the whole turned over and carefully removed the cup. With the help of a glass post and the long blow pipe, the resulting shape was placed in the mold and taken out again. After heating, it was transferred to the (shorter) pontil iron, the edge cut off and then further finished with a wooden spatula. Tumbler cups cannot stand alone but lie well in the palm of the hand to drink from. It is not for nothing that such a cup is called a palm cup in the Angel-Saxon countries. The contents had to be consumed (as with the pouring cup) in one gulp, after which the glass was put upside down. As already pointed out in the introduction, scholars do not entirely agree whether they were placed in the sand or whether there was perhaps a sort of (wooden) standard. Remnants of these have never been found.